Durzogs are hostile reptilian creatures. 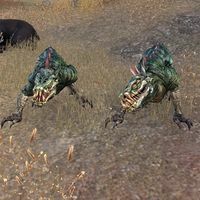 They are four-legged, dark green, and striped, and have spines along their backs, with six red eyes and long teeth. Upon death they drop clothing materials. They are often found in the company of their goblin masters. 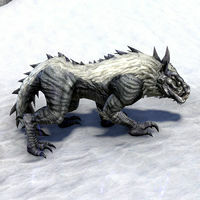 The durzogs in Wrothgar have steel blue scales and are covered in white feathers. They usually accompany riekrs. A charged up melee attack that does moderate physical damage with minor physical damage over time. This attack can be blocked to set the durzog off balance. Getting a Bellyful: Obtain special durzog feed for a client for the Dragonstar Caravan Company. This page was last modified on 19 July 2018, at 22:57.